Angry Bear » Will Japan ever understand the Fisher Effect? Will Japan ever understand the Fisher Effect? The graph shows Japan’s central bank discount rate, GDP yoy growth rate, CPI minus food and energy and the real interest rate. The real rate (green line) did in fact return to and stabilize around its natural rate of 1% just as the Fisher effect would expect. This evidence supports the long run Fisher effect. Inflation did jump up in the late 1990’s which looks to reflect GDP reaching its natural level. GDP (red line) rose and then declined transferring the momentum of nominal GDP into prices (violet line). The real interest rate stayed close to its natural rate from 2000 until the crisis. Then after the crisis, the real rate returned once again to its natural rate until Abenomics pushed inflation up above the discount rate. The real rate fell again. The question now is… Is the inflation in Japan temporary? Will the real rate return to its 1% natural rate pushing inflation back down? Will Japan’s central bank keep the discount rate near the zero lower bound? Update updated: Graph above has been fixed, thanks to Mark Sadowski. 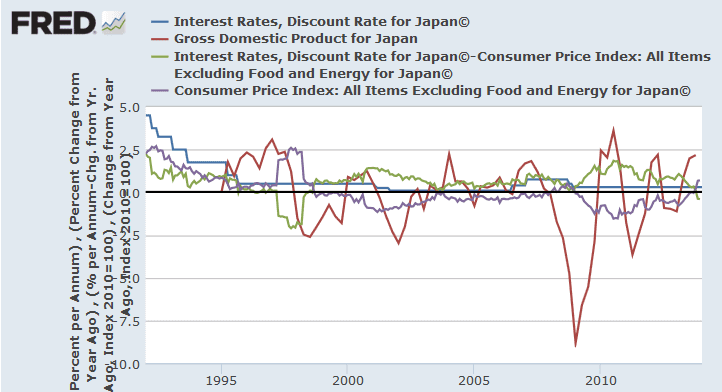 Here is a graph just for the real interest rate based on Japan’s discount rate and CPI without food and energy. Nominal GDP would be lower without accommodative monetary policy. Other factors (which I cited some before) are holding back growth. Producers and consumers don’t see a lasting pick-up in demand to drive real growth, inflation, and interest rates higher. The beginning of a tightening cycle, at this point, would just cause a recession, and we’d be back to quantitative easing. “Martin Schulz, an economist at Fujitsu Research Institute in Tokyo, said that the three main pillars underlying Japan’s emergence from the “lost decade” of the 1990s — favorable exchange rates, overseas investment and demand, and old industry such as steel, cars and chemicals — have crumbled. Perhaps you are looking at an increase in labor share in Japan? What if Japanese employers saw the economy tightening (see Martin Schulz above) and tightened the purse strings in December 2008. Then last year at the Prime Minister’s urging they loosened the purse strings again? Now the question is why did inflation go positive in February 2008? I note the positive inflation (purple) started in August 2013 and the real interest rate (green) went negative at the same time. In September inflation was negative again and real interest rates were positive again. Then in October and forward to the end of 2013 inflation was positive and real interest rates were negative. This positive inflation (purple) happened once before from February to December of 2008. The real interest rate (green) went negative at the same time in February and went back positive in May 2009. So why are real interest rates going negative? Because the Japanese discount rate is struck at .3% and as inflation goes up the real rate goes down. Not interesting. But why did the real interest rate stay negative until May 2009 instead of rising as inflation fell??? Possibly some sort of error in the collected or presented data. There is no doubt that accommodative monetary policy helped nominal GDP grow in the first few years after the crisis. And it continues to do so now, but only for the upper parts of the wealth spectrum. Monetary expansion is bifurcated. And a tightening cycle now would trigger a recession. But that is the short run effect. In the long run the interest rate will have to rise. That is why I say that the Fed should have started raising the Fed rate 2 years ago. I have been saying that for months and months. Yet the understanding of the Fisher effect has to come now, otherwise we will have the same problem for years and years just like Japan, who never understood that low interest rates led to deflation. And the low interest rates were supported by other factors weakening inflation pressures. Then deflation settled into a position equivalent to the Fisher effect. Thus, if inflation is settling into the Fisher effect, then a higher nominal interest rate would allow a higher inflation rate since the natural real rate is independent of monetary policy. Eventually we get a higher inflation rate if rates go up now. But do we eventually get a higher growth rate too? Or is the higher inflation just a consequence of the supply side destruction caused by the recession due to higher rates? 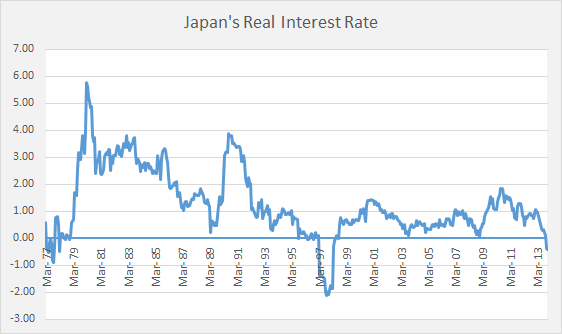 You will probably get your natural rate of interest eventually if you raise rates in Japan but you want real growth you dont just want to cause inflation by causing instability through recesions undermining supply side. Instability and economic malaise destroy the supply side. I think your focused on the real rate of interest which is not important the real rate of growth is. Edward, what you’re really saying is destroying potential output faster, through a recession, will lead to normal growth, and higher interest rates, more quickly. I agree, if a smaller economy is the goal. However, the Fed has been minimizing the destruction of potential output through faster nominal growth, ceteris paribus. Accommodative monetary policy continues to be a positive for everyone, directly or indirectly. Inflation does not lower the growth rate. It can actually be a boost to supply and demand. You see that when the economy is said to be heating up. It is still nice to not forget one important thing. There needs to be a global effort to raise labor share. Effective demand is constraining output, productivity, monetary policy and more. Labor share needs to reverse its fall. Yes there would be an initial shock from raising the nominal rate, but that shock can be softened. There are ways to soften the shock to minimize the chance of a recession. If you want line #3 to represent the “real Discount Rate” you need to change b so that it is equal to the Discount Rate and not the change in the Discount Rate. 2) The Discount Rate is *not* the BOJ’s policy rate. The BOJ’s policy rate is the *Call Rate*. The Discount Rate is the rate at which the BOJ makes loans to the private sector. The Call Rate is the unsecured overnight interbank lending rate and so is the equivalent of the Fed Funds Rate in the US. Prior to 1995 the Call Rate was always more than the Discount Rate and often significantly more. Since 1998 the Call Rate has been between 10 and 50 basis points less than the Discount Rate. 3) Line #2 is NGDP. There is nothing wrong with that, but given your other errors it is not clear to me if you know that is Nominal GDP (NGDP) and that it is not real GDP (RGDP). Japan raised its Consumption Tax from 3% to 5% at the beginning of the 1997 Fiscal Year on April 1, 1997. This artificially boosts the year on year core-core CPI from April 1997 through March 1998. Unfortunately there is no tax adjusted CPI series. You either have to make your own adjustment or make note of it. 5) This post is rife with elementary errors. If you can’t correctly construct a simple FRED formula, don’t know which interest rate is the official BOJ policy rate, and don’t know the history of how Japanese tax policy has affected the CPI, you have no business attempting to do a post on Japan supporting your gross miscomprehension of the Fisher Effect. You are definitely an expert with data.